The opening credits sequence of Asghar Farhadi’s latest film, The Salesman—nominated Tuesday for a Best Foreign Film Oscar—suggests the distinguished Iranian filmmaker will tackle fresh stylistic territory. Instead of his drably realistic shots of outdoor settings, it’s set on a stage, with high-contrast lighting that veers between flashy neon and deep blacks. We soon discover it’s the set of a production of Arthur Miller’s Death of a Salesman, one featuring the film’s two leads, Emad (Shahab Hosseini) and Rana (Taraneh Alidoosti) Etesami, as Willy and Linda Loman, respectively. The air is thick in these early stages of a mingling of fiction and reality the likes of which Farhadi has never attempted before. To some extent, that promise is fulfilled, but in ways that turn out to be much knottier and more complicated than expected. Leave it to Farhadi—a dramatist who swims in the often agonizing complexities of human relationships—to find the most indirect way to approach even a meta-theatrical conceit like this. Emad may portray the salesman of Miller’s play, and Rana his faithful wife, but the salesman of the film’s title turns out to be neither of these two main characters. What’s more, the namesake doesn’t even appear until the film’s third act, as Emad closes in on the culprit who violently attacked and mentally shattered his wife in their new apartment. Only in this last act do any convergences between Farhadi’s world and Miller’s become apparent, and even then it has barely anything to do with Emad and/or Rana, but with the characters they’re both either judging or trying to be compassionate toward. 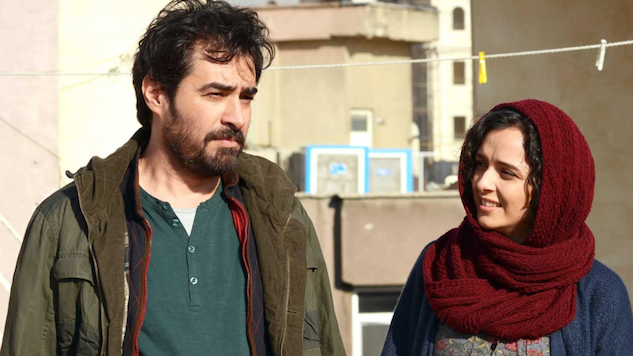 The Salesman is essentially another of Farhadi’s morality tales, with characters who are neither simply good nor evil, but deeply, disturbingly human in their sometimes unconscionable flaws. But if, in many of his previous films, Farhadi laid out the complex motivations of his characters with the clear-eyed acuteness of a social scientist, the two main characters of his latest are more psychologically elusive than any he’s yet explored on screen. Rana, in particular, can come off as inexplicable in her actions. Even as she is clearly suffering from trauma in the wake of her assault, she refuses to report the incident to the Iranian authorities; only a neighbor’s speculation that said authorities would mishandle an investigation and end up blaming the victim suggests any understandable motive for her silence. (Also, the fact that technically she did invite her attacker in, opening the apartment door for him mistakenly believing it to be her husband, implies a level of embarrassment she wants to avoid). Ultimately the film is Emad’s story, especially when he takes it upon himself to play amateur investigator and find out who attacked his wife. It’s through his sleuthing, however, that a darker side to a previously agreeable and intensely focused character emerges. Beyond the tension that develops between Emad and his wife after the violent incident, one scene in the middle of the film foreshadows this more authoritarian side. In a confrontation with a student who has snapped photos of him dozing off in class while screening a movie, he responds by taking the student’s phone and rifling through his personal photos without an ounce of concern for the invasion of privacy this represents. Emad proves that, in certain situations, he’s not much different from a repressive national government that will go so far as to demand three lines from Death of a Salesman be cut just because it somehow violates ethical standards. The film’s meta-theatrical angle adds another layer of characterization to/criticism of Emad. Note a seemingly throwaway scene early in the film in which he responds to a student’s anger at the inconsiderate way a taxicab passenger treated Emad the day before, hypothesizing a rationalization of the passenger’s mindset. The art of acting, to a considerable extent, is all about tapping into one’s capacity for human empathy, and that one scene suggests that Emad has no problem exercising such imagination with the behavior of total strangers. But if there’s a character arc to be found in The Salesman beyond its detective narrative, it’s in the way the attack on Rana and its fraught aftermath exposes the limits of Emad’s empathy. Once he discovers who’s responsible, we witness a side of Emad that verges on the homicidal, in an out-of-proportion act of revenge that is a far cry from the kind of compassion Arthur Miller evinced toward Willy Loman in Death of a Salesman. In that sense, The Salesman is the closest Farhadi has come thus far in his career to a work of self-examination. We know from films like Fireworks Wednesday, About Elly and A Separation that this filmmaker is capable of sensitivity to female anguish; it’s one reason his last film, the French-language melodrama The Past, was slightly disappointing, featuring a largely hysterical female character who felt less fleshed-out than her male counterparts, more at their service than with any agency of her own. Perhaps The Salesman is a response to that experience: a film that features a similarly backward dynamic but turns it on its head once we grasp that only the woman can claim the moral high ground relinquished by the man for the sake of … pride? Vengeance? Satisfaction that he’s fulfilling his societally mandated role as protector and provider? As with Farhadi’s best work, such questions of humanity and morality linger long after the particulars of its plot have dissolved from memory.